Ghost Cop makes a request before they go back to stop Lobster Man. Axe Cop’s new plan that is not as gross. Lobster Man reveals his plan. 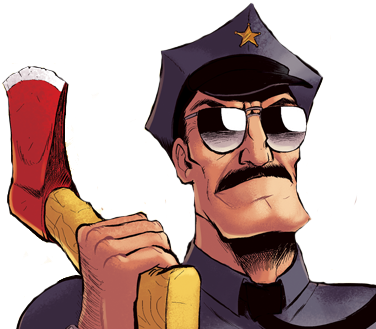 Axe cop wants to kill fishy fish before he eats any good guy’s brains. The origin of Lobster Man and Hasta Mia. Searching for Hasta Mia and Fishy Fish. Son, You Can Be on My Team.